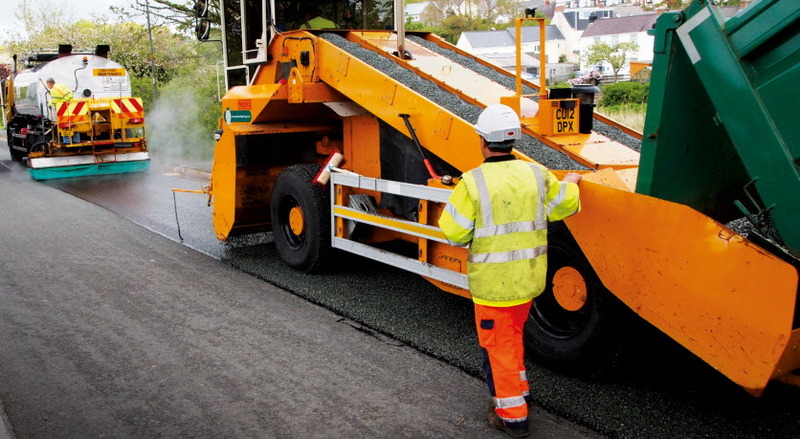 Nynas Fleximuls emulsion is a BBA HAPAS approved polymer modified, cationic road emulsion designed to meet the performance requirements for intermediate grade surface dressing binders as specified in the Highways Agency clause 922. Nevertheless, the county council wanted to improve its performance and also address quality issues. The PCC felt it needed better product and application quality to extend the lifecycle of its surface dressing and ensure better value. A possible solution was to find the best ‘supply and apply’ binder contractor and award it not just a conventional annual contract, but one of six years. Pembrokeshire has nearly 2,500 km of roads. PCC’s surface dressing programme is cyclical, with the county council re-dressing every 8 to 10 years. The council’s own direct labour organisation (DLO) people operate the chippers and rollers but traditionally the PCC have contracted out the supply and application of binder. It was over binder supply and application that the county council encountered difficulties. Some years back PCC started receiving complaints from the public and it had some difficult seasons with contractors who did not perform well – with inadequate application standards or poor binder products, both often difficult to discern until after the laying seasons were over. PCC wanted to improve its end results from supply and apply contracts. This is when Nynas came into the picture, firstly through supplying a binder that actually worked consistently well, then as the contractor charged with applying the bitumen in just the right way. Nynas leads a collaboration with Asphalt Reinforcement Services (ARS) which has specialist experience in spraying bitumen. As a result of this partnership, the reports back to the PCC on quality from its own site operatives changed from negative to highly positive. Come the end of the surface dressing season, it is traditional to begin preparing bids for the following year. There is no ‘security of tenure’ and as such, no incentive for companies to invest in plant or additional staff training and skills development. This was recognised by the PCC, leading the county council to introduce its new approach of an extended contract. The council made a decision to ask for bids for a groundbreaking five years plus one supply and apply contract, to serve the county council’s surface dressing and training needs. Nynas won with its bid and now has continuity of work (all things being equal) until 2020. Part of the success of surface dressing at Pembrokeshire is due to the county council changing from standard K170 binder emulsions to polymer modified emulsions (PME). Nynas encouraged the county to use its Nynas Fleximuls, which is an intermediate grade PME, with some Duramuls – a premium grade product – for high stress sections of road, such as tight corners where ground water is frequently evident. Nynas is responsible for supplying and applying the bitumen.